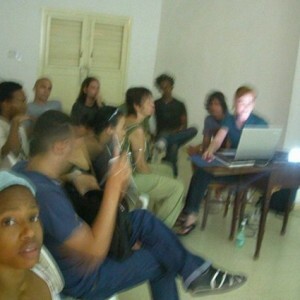 I was invited by cuban performance artist Tania Bruguera to give a workshop in site specific photo collage, at Arte de Conducta (behavior art), the first performance studies program in Latin America, which is hosted by Instituto Superior de Arte in Havana. Bruguera is the founder of Arte de Conducta = (art of behavior) which was located in "Old Havanna". The workshop "how to make a site specific photo montage" was based on my site specific project "Here, there and everywhere" where I change the cityscape in various nordic cities through digital montage. The photos are taken from the pedestrian pint of view, and display a slightly different urban setting.